Professor Nick Cross is Professor of Human Genetics within Medicine at the University of Southampton. Nick Cross read Natural Sciences at Cambridge University and stayed on to do a PhD in the Department of Genetics. He moved to the Hammersmith Hospital in 1987, where he developed an interest in leukaemia. Working initially on the development of quantitative molecular assays to determine the response of patients to therapy, he developed a research programme aimed at understanding the molecular genetics of myeloid neoplasms. This work has resulted more than 250 peer reviewed publications and is continuing in Salisbury, where he relocated in 2001 to take up Directorship of the Wessex Regional Genetics Laboratory and a Chair of Human Genetics at the University of Southampton. In 2002 he led a successful bid to establish one of two National Genetics Reference Laboratories (NGRL), with a focus on the development, validation and standardisation of genetic tests. 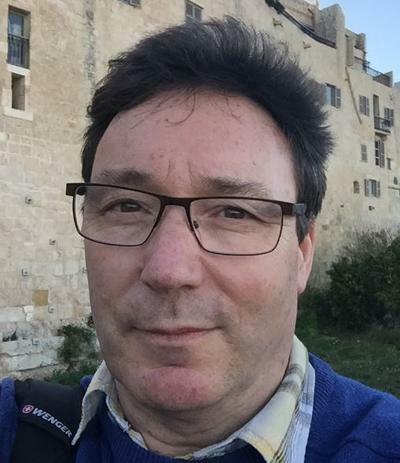 Nick Cross is interested in the molecular pathogenesis of haematological malignancies, in particular chronic myeloid leukaemia (CML), myeloproliferative neoplasms (MPN) and myelodysplastic syndromes (MDS). Initially our work focused on the analysis of chromosome translocations which, despite being uncommon, proved to be an important route towards understanding the molecular pathogenesis of myeloid malignancies. We have characterized more than 25 different translocations and found that the majority result in fusion genes encoding chimaeric proteins with an N-terminal region derived from a partner gene fused in frame to the C-terminal region of a tyrosine kinase such as ABL, PDGFRα, PDGFRβ, JAK2, KIT or FGFR1. Tyrosine kinases are excellent drug targets and we are using preclinical models to evaluate the efficacy of novel small molecule inhibitors against activated tyrosine kinases in myeloid disorders. Our principal focus has been the use of genomewide profiling techniques to identify novel, somatically acquired genetic abnormalities. Recently our focus has been on whole exome, whole genome and RNA sequencing to identify novel mutations, particularly in association with acquired uniparental disomy. Notable achievements have been the finding of recurrent mutations in genes encoding the signalling regulator CBL (Grand et al. Blood 2009) the polycomb group protein EZH2 (Ernst et al. Nature Genetics 2010) and PRR14L, a gene of unknown function (Chase et al., Leukemia 2019). Other candidate abnormalities and genomic regions are currently under investigation, as is the functional analysis of novel abnormalities. Many MPN are characterised by the presence of the acquired JAK2 V617F mutation. We made the remarkable finding that this mutation does not arise randomly, but rather it is seen preferentially on a common JAK2 haplotype that we have called 46/1 (Jones et al. Nature Genetics 2009). The molecular basis for this predisposition is under investigation but must presumably be a consequence of increased mutation rates (hypermutability hypothesis) or a functional difference in JAK2 that confers a selective advantage when this gene is mutated (fertile ground hypothesis). We are undertaking genomewide association studies to define other genetic loci that predispose to MPN. We have had a long standing interest in the development of genetic tests, and one of our main areas of current activity is the standardisation of molecular monitoring of CML patients by qRT- PCR for BCR-ABL mRNA. We have developed primary, World Health Organisation approved reference reagents for BCR-ABL testing (White et al. Blood 2010) and are working with colleagues in Europe and internationally to help improve and standardise laboratories testing for minimal residual disease in CML (Cross et al., Leukemia 2012; Cross et al., Leukemia 2015). Other projects include the development and application of next generation sequencing based panel tests for a variety of malignant conditions and the development of novel sensitive tests to monitor the response of cancer patients to treatment. Levavi, H., Tripodi, J., Marcellino, B., Mascarenhas, J., Jones, A. V., Cross, N., ... Najfeld, V. (Accepted/In press). A novel t(1;9)(p36;p24.1) JAK2 translocation and review of the literature. Acta Haematologica. Mobius, S., Schenk, T., Himsel, D., Maier, J., Franke, G-N., Saussele, S., ... Ernst, T. (Accepted/In press). Results of the European survey on the assessment of deep molecular response in chronic phase CML patients during tyrosine kinase inhibitor therapy (EUREKA registry). Journal of Cancer Research and Clinical Oncology. Zoi, K., & Cross, N. (2017). Genomics of myeloproliferative neoplasms. Journal of Clinical Oncology, 35(9), 947-954. Cross, N. C. P. (2011). Histone modification defects in developmental disorders and cancer. Oncotarget, 3(1), 3-4. Cross, N. C. (2008). Hitchhikers' guide to the leukemia genome. Blood, 111(9), 4428-4429. Curtis, C., Grand, F. H., Kreil, S., Oscier, D. G., Hall, A. G., & Cross, N. C. P. (2007). Acquired isodisomy is common in atypical myeloproliferative disorders. Haematologica, 92(Supplement 1), 152S-152S. Score, J., Calasanz, M. J., Pane, F., Ottmann, O., Grand, F. H., & Cross, N. C. P. (2007). Analysis of T(9;22) breakpoints indicates that P210 and P190 BCR-ABL are formed by distinct mechanisms. Haematologica, 92(Supplement 1), p.1. Score, J., Calasanz, M. J., Pane, F., Ottmann, O., Cross, N. C. P., & Grand, F. H. (2007). Analysis of T(9;22) breakpoints indicates that P210 and P190BCR-ABL are formed by distinct mechanisms. Haematologica, 92(supplement 1), 1. Grace, C., Brazma, D., Chanalaris, A., Howard, J., Virgili, A., Valgañon, M., ... Nacheva, E. (2007). Array CGH analysis at 60kb resolution of CML samples at advanced stage of disease. Blood, 110(11), p.860A. Chiecchio, L., Dagrada, G. P., Protheroe, R. K. M., Leone, P. E., Nightingale, M., Stockley, D. M., ... Ross, F. M. (2007). Chromosome 1 abnormalities in myeloma and MGUS. Haematologica, 92(6), p.103. Walz, C., Ritter, M., Haferlach, C., Schnittger, S., Schulte, C., Haferlach, T., ... Reiter, A. (2007). Complete hematologic response to sunitinib in an eosinophilia-associated chronic myeloproliferative disorder with an ETV6-FLT3 fusion gene. Blood, 110(11), p.1041A. David, M., Cross, N. C., Burgstaller, S., Chase, A., Curtis, C., Dang, R., ... Apperley, J. F. (2007). Durable responses to imatinib in patients with PDGFRB fusion gene-positive and BCR-ABL-negative chronic myeloproliferative disorders. Blood, 109(1), 61-64. DOI: 10.1182/blood-2006-05-024828. Simoes, M. S., Score, J., Cross, N. C. P., Apperley, J. F., & Melo, J. V. (2007). How cured are CML patients in complete molecular remission (CMR) after stem cell transplantation or imatinib? Blood, 110(11), p.306A. Ross, F. M., Chiecchio, L., Dagrada, G. P., Protheroe, R. K. M., Nightingale, M., Stockley, D. M., & Cross, N. C. P. (2007). IGH rearrangements in plasma cell dyscrasias. Haematologica, 92(6, Supplement 2), 102-103. Wang, Y. L., Vandris, K., Jones, A. V., Cross, N. C. P., Christos, P. J., Adriano, F., & Silver, R. T. (2007). JAK2 mutations are present in all cases of polycythemia vera. Blood, 110(11), p.241B. Silver, R. T., Vandris, K., Wang, Y. L., Christos, P. J., Adriano, F., Jones, A. V., & Cross, N. C. P. (2007). JAK2(V617F) mutational load in patients with Polycythemia Vera (PV) measured by peripheral blood DNA is associated with disease severity. Blood, 110(11), p.746A. Pfirrmann, M., Kreil, S., Haferlach, C., Wagdorn, K., Chase, A., Hehlmann, R., ... Cross, N. C. P. (2007). Multiple analyses affirm the independent adverse influence of ABL/BCR breakpoint spanning deletions on surival in chronic myeloid leukemia. Haematologica, 92(Supplement 1), p.205. Kreil, S., Waghom, K., Hehlmann, R., Reiter, A., Hochhaus, A., & Cross, N. C. P. (2007). Polymorphic variation at the STAT5 locus is associated with the response of CML patients to interferon alpha. Blood, 110(11), p.857A. Brito-Babapulle, F., & Cross, N. C. P. (2007). Redefinition of hypereosinophilic disorders based on an analysis of 28 cases of FIP1L1-PDGFRA negative persistent unexplained eosinophilia (PUE) with eosinophil end-organ damage (EEOD). Blood, 110(11), p.972A. Ross, F. M., Chiecchio, L., Protheroe, R. K. M., Dagrada, G. P., Stockley, D. M., Nightingale, M., ... Orchard, K. H. (2007). Stable asymptomatic myeloma and MGUS in the presence of T(4;14). Haematologica, 92(Supplement 1), 330-331. Reiter, A., Walz, C., & Cross, N. C. P. (2007). Tyrosine kinases as therapeutic targets in BCR-ABL negative chronic myeloproliferative disorders. Current Drug Targets, 8(2), 205-216. Zhang, L-Y., Xu, G-L., & Cross, N. C. P. (2006). [Application of denaturing high performance liquid chromatography to mutation detection of the c-kit gene in mastocytosis]. Zhongguo shi yan xue ye xue za zhi [Journal of Experimental Hematology], 14(5), 981-984. Jenner, M. W., Leone, P. E., Walker, B. A., Johnson, D. C., Chiecchio, L., Cabanas, E. D., ... Morgan, G. J. (2006). Abnormalities of 16q in multiple myeloma are associated with poor prognosis: 500K gene mapping and expression correlations identify two potential tumor suppressor genes, WWOX and CYLD. Blood, 108(11), p.37A. Khorashad, J. S., Lipton, J. H., Marin, D., Milojkovic, D., Cross, N. C. P., Dibb, N., ... Kaeda, J. S. (2006). Abnormally small BCR-ABL transcripts in CML patients before and during imatinib treatment. Blood, 108(11), p.611A. Chen, Q., Lu, P., Jones, A. V., Cross, N. C., Silver, R. T., & Wang, Y. L. (2006). Amplification refractory mutation system (ARMS), a highly sensitive and simple PCR assay for the detection of JAK2 V617F mutation in chronic myeloproliferative disorders. Journal of Molecular Diagnostics, 8(5), p.634. Walz, C., Metzgeroth, G., Schoch, C., Haferlach, T., Hehlmann, R., Hochhaus, A., ... Reiter, A. (2006). Characterization of two new imatinib-responsive fusion genes generated by disruption of PDGFRB in eosinophilia-associated chronic myeloproliferative disorders. Blood, 108(11), p.200A. Hyjek, E., Chadbum, A., Cross, N. C. P., Jones, A. V., Sun, S-C. P., Mathew, S., ... Silver, R. T. (2006). Correlation of clinical and molecular response to imatinib in polycythemia vera (PV) patients with bone marrow morphologic and immunophenotypic changes. Blood, 108(11), p.315B. Erben, P., Mueller, M. C., Metzgeroth, G., Popp, H., Walz, C., Schenk, T., ... Reiter, A. (2006). Diagnosis and monitoring of residual disease by quantitative RT-PCR in eosinophilia-associated myeloproliferative disorders with rearrangements of PDGFRA and PDGFRB. Blood, 108(11), 760A-761A. Gavrilescu, L. C., Cross, N. C. P., & Van Etten, R. A. (2006). Distinct leukemogenic activity and imatinib responsiveness of a BCR-PFGFRalpha fusion tyrosine kinase. Blood, 108(11), p.1038A. Gavrilescu, L. C., Cross, N. C. P., & Van Etten, R. A. (2006). Distinct leukemogenic activity and imatinib responsiveness of a BCR-PFGFR-alpha fusion tyrosine kinase. Blood, 108(11), p.1038A. Kreil, S., Waghorn, K., Pfirrmann, M., Reiter, A., Hehlmann, R., Hochhaus, A., & Cross, N. C. P. (2006). Heterogeneous prognostic impact of 9q+ deletions in patients with chronic myelogenous leukemia. Blood, 108(11), p.599A. White, H., Hall, V. J., Boyle, T., Warner, J., McLuskey, J., Sibbring, J., ... Cross, N. C. P. (2006). NGRL (Wessex) evaluation of CE marked in vitro diagnostic test kits for prenatal diagnosis of aneuploidy. Journal of Medical Genetics, 43, pp.S91. Silver, R. T., Lee, S., Jones, A. V., Rivera, M., Feldman, E. J., Roboz, G., ... Cross, N. (2006). The frequency of the JAK2 V617F mutation in patients with polycythemia vera and its correlation with severity of disease. Journal of Clinical Oncology, 24(18S), 358S-358S. Oscier, D. G., Jones, A., Wallis, L., Chacko, J., & Cross, N. C. P. (2006). The utility of V617F JAK2 analysis for patients with erythrocytosis or thrombocytosis in the general hospital. Blood, 108(11), p.1037A. Chase, A., Grand, F. H., & Cross, N. C. P. (2006). TKI258 (CHIR-258) selectively inhibits FGFR1 fusion genes associated with the 8p11 myeloproliferative syndrome. Blood, 108(11), p.763A. Mc Lornan, D. P., Percy, M. J., Jones, A. V., Cross, N. C., & Mc Mullin, M. F. (2005). Chronic neutrophilic leukemia with an associated V617F JAK2 tyrosine kinase mutation. Haematologica, 90(12), 1696-1697. Chiecchio, L., Protheroe, R. K. M., Parker, T., Rudduck, C., Cheung, K. L., Dagrada, G., ... Ross, F. M. (2005). Critical importance of conventional cytogenetics in detecting prognostically significant chromosome 13 deletions in myeloma. Blood, 106(11), p.443A. Mistry, A. R., Felix, C. A., Whitmarsh, R. J., Mason, A., Reiter, A., Cassinat, B., ... Grimwade, D. (2005). DNA topoisomerase II in therapy-related acute promyelocytic leukemia. New England Journal of Medicine, 352(15), 1529-1538. White, H., Durston, V. J., Harvey, J. F., & Cross, N. C. P. (2005). Evaluation of ChromoQuant in vitro diagnostic test kits (versions 1 and 2) for analysis of aneuploidy. Journal of Medical Genetics, 42, pp.S97. Rives, S., Alcorta, I., Toll, T., Tuset, E., Estella, J., & Cross, N. C. P. (2005). Idiopathic hypereosinophilic syndrome in children: report of a 7-year-old boy with FIP1L1-PDGFRA rearrangement. Journal of pediatric hematology/oncology, 27(12), 663-665. Jones, A. V., Higley, K., Curtis, C., Kreil, S., Zoi, K., Hochhaus, A., ... Cross, N. C. P. (2005). No significant molecular response in polycythemia vera patients treated with imatinib or interferon alpha. Blood, 106(11), p.113A. Jovanovic, J., Reiter, A., Cilloni, D., Gottardi, E., Score, J., Popp, H., ... Grimwade, D. (2005). Oral sessions. Sensitive detection of FIP1L1-PDGFRA fusion transcripts by real-time quantitative RT-PCR (RQ-PCR) reveals achievement of molecular remission in chronic eosinophilic leukemia treated with low-dose imatinib therapy. Blood, 106(11), p.145A. White, H., Potts, G. L., Durston, V. J., Harvey, J. F., & Cross, N. C. P. (2005). Reference reagents for genetic testing: development of mutation detection controls by NGRL (Wessex). Journal of Medical Genetics, 42, pp.S97. Jovanovic, J., Reiter, A., Cilloni, D., Gottardi, E., Score, J., Popp, H., ... Grimwade, D. (2005). Sensitive detection of FIP1L1-PDGFRA fusion transcripts by real-time quantitative RT-PCR (RQ-PCR) reveals achievement of molecular remission in chronic eosinophilic leukemia treated with low-dose imatinib therapy. Blood, 106(11), p.145A. Grand, F. H., Iqbal, S., Zhang, L., Russell, N. H., Chase, A., & Cross, N. C. P. (2005). SPTBNI-FLT3 in atypical chronic myeloid leukemia transforms Ba/F3 cells to IL-3 independence and is sensitive to both tyrosine kinase inhibitors and immunotherapy. Blood, 106(11), p.568A. Curtis, C., Apperley, J. F., Dang, R., Jeng, M., Gotlib, J., Cross, N. C. P., & Grand, F. H. (2005). The platelet-derived growth factor receptor beta fuses to two distinct loci at 3p21 in imatinib responsive chronic eosinophilic leukemia. Blood, 106(11), p.909A. Reiter, A., Walz, C., Watmore, A., Schoch, C., Blau, I., Schlegelberger, B., ... Cross, N. C. P. (2005). The t(8;9)(p22;p24) is a recurrent abnormality in chronic and acute leukemia that fuses PCM1 to JAK2. Cancer Research, 65(7), 2662-2667. Walz, C., Schultheis, B., Metzgeroth, G., Schoch, C., Curtis, C., Lengfelder, E., ... Reiter, A. (2005). Transient response to imatinib in an atypical chronic myeloproliferative disease associated with ins(9;4)(q34;q21q31) and a CDK5RAP2-PDGFRA fusion gene. Blood, 106(11), p.917A. Silver, R. T., Jones, A. V., Feldman, E. J., Roboz, G. J., Ritchie, E. K., & Cross, N. C. P. (2005). Validation of JAK2 and new clinical criteria for the diagnosis of Polycythemia Vera (PV). Blood, 106(11), p.323B. Mattocks, C., White, H. E., Owen, N., Durston, V. J., Harvey, J. F., & Cross, N. C. P. (2004). An evaluation of the MassCLEAVE(tm) biochemistry for diagnostic screening. Journal of Medical Genetics, 41, pp.S75. White, H., Durston, V. J., Seller, A., Fratter, C., Harvey, J. F., & Cross, N. C. P. (2004). Detection and estimation of heteroplasmy for mitochondrial mutations using NanoChip and Pyrosequencing technology. Journal of Medical Genetics, 41, pp.S72. White, H., Durston, V. J., Strike, P., Deutsch, S., Harvey, J. F., & Cross, N. C. P. (2004). Detection of chromosomal aneuploidy by paralogous gene quantification using the Pyrosequencing PSQ 96MA System. Journal of Medical Genetics, 41, pp.S72. Cross, N. C. P., Chase, A. J., Drachenberg, M., Roberts, W. M., Finklestein, J. Z., & Grand, F. H. (2004). Fusion of SFPQ to ABL in a patient with a T(1;9)(p34;q34) and acute lymphocytic leukemia. Blood, 104(11), p.194B. Martinelli, G., Cilloni, D., Ottaviani, E., Malagola, M., Messa, F., Rondoni, M., ... Saglio, G. (2004). Idiopathic hypereosinophilic syndrome (HES) with FIP1L1-PDGFRA rearrangement can be effectively treated with Imatinib. Blood, 104(11), p.421A. Bastie, J. N., Garcia, I., Terre, C., Cross, N. C., Mahon, F. X., & Castaigne, S. (2004). Lack of response to imatinib mesylate in a patient with accelerated phase myeloproliferative disorder with rearrangement of the platelet-derived growth factor receptor beta-gene. Haematologica, 89(10), 1263-1264. Bunyan, D. J., Brown, T., Wycherley, R., Score, J. C., Harvey, J. F., & Cross, N. C. P. (2004). MLPA-based point mutation analysis of the FBN1 gene in Marfan syndrome. Journal of Medical Genetics, 41(S75), 1-1. Bunyan, D., Brown, T., Wycherley, R., Score, J., Harvey, J. F., & Cross, N. C. P. (2004). MLPA-based point mutation analysis of the FBN1 gene in Marfan syndrome patients. Journal of Medical Genetics, 41, pp.S75. Vizmanos, J., Novo, F. J., Roman, J. P., Baxter, E. J., Lahortiga, I., Larrayoz, M. J., ... Cross, N. C. P. (2004). NIN, a gene encoding a CEP110-like centrosomal protein, is fused to PDGFRB in a patient with a t(5;14)(q33;q24) and an imatinib-responsive myeloproliferative disorder. Cancer Research, 64(8), 2673-2676. Reiter, A., Walz, C., Watmore, A., Schoch, C., Blau, I., Telford, N., ... Cross, N. C. P. (2004). Recurrent fusion of PCM1 to JAK2 in atypical chronic myeloid leukemia and acute leukemia associated with the t(8;9)(p21-22;p23-24). Blood, 104(11), 809A-810A. Wood, O., Mattocks, C. J., Sillibourne, J., Owen, N., Harvey, J. F., & Cross, N. C. P. (2004). Standardised primer optimisation and design specification. Journal of Medical Genetics, 41, pp.S75. Copson, E., White, H. E., Cross, N. C. P., Eccles, D., & Robinson, D. O. (2004). Use of Pyrosequencing technology to quantitate allele expression in patients with BRCA1 mutations. Journal of Medical Genetics, 41, pp.S72. Mattocks, C., Tarpey, P. S., Whittaker, J. L., Harvey, J. F., & Cross, N. C. P. (2003). A large scale validation of prototype software for high throughput Comparative Sequence Analysis. Journal of Medical Genetics, 40, pp.S79. Cools, J., DeAngelo, D. J., Gotlib, J., Stover, E. H., Legare, R. D., Cortes, J., ... Gilliland, D. G. (2003). A tyrosine kinase created by fusion of the PDGFRA and FIP1L1 genes as a therapeutic target of imatinib in idiopathic hypereosinophilic syndrome. New England Journal of Medicine, 348(13), 1201-1214. Mattocks, C., Harvey, J. F., & Cross, N. C. P. (2003). An evaluation of the AutoGen NA-3000EU automatic nucleic acid isolation system. Journal of Medical Genetics, 40, pp.S78. Reiter, A. E. K., Walz, C. F. H., Schoch, C., Chase, A. J., Fuchs, R., Hochhaus, A., ... Cross, N. C. P. (2003). Characterization of two new fusion genes in the 8p11 myeloproliferative syndrome (EMS) generated by disruption of FGFR. Blood, 102(11), pp.108A. Bunyan, D., Thomas, N. S., Cross, N. C. P., & Harvey, J. F. (2003). Importance of mutation screening in 'false-positive' MLPA cases. Journal of Medical Genetics, 40, pp.S80. Thomas, S., Maloney, V., Bunyan, D. J., Cross, N. C. P., & Harvey, J. F. (2003). Investigation of the SHOX gene and Pseudoautosomal Region 1 in cases of Leri-Weill dyschondrosteosis. Journal of Medical Genetics, 40, pp.S84. Martinelli, G., Cilloni, D., Ottaviani, E., Malagola, M., Cross, N., Rosti, G., ... Baccarani, M. (2003). Italian cooperative study on idiopathic hypereosinophilic syndrome (HES): FIP1-L1/PDGFRA rearrangement can be effectively treated with imatinib. Blood, 102(11), pp.386A. Walz, C., Grimwade, D., Saussele, S., Weisser, A., Lafage-Pochitaloff, M., Hochhaus, A., ... Reiter, A. (2003). Mechanisms underlying loss of reciprocal fusion gene expression in acute promyelocytic leukaemia: evidence for deletions on der(17) and complex rearrangements yielding novel fusion gene transcripts. Blood, 102(11), pp.846A. Mistry, A. R., Felix, C. A., Whitmarsh, R., Mason, A., Reiter, A., Cassinat, B., ... Grimwade, D. (2003). Mitoxantrone induces DNA topoisomerase II cleavage at translocation breakpoint hotspot in PML gene in acute promyelocytic leukemia. Blood, 102(11), pp.215A. Chase, A., Higley, K., Baxter, J. F. E., & Cross, N. C. P. (2003). Testing in-vitro for imatinib sensitivity in BCR-ABL negative myeloproliferative disorders. Blood, 102(11), pp.658A. Billio, A., Steer, E. J., Pianezze, G., Svaldi, M., Casin, M., Amato, B., ... Cross, N. C. (2002). A further case of acute myeloid leukaemia with inv(8)(p11q13) and MOZ-TIF2 fusion. Haematologica, 87(5), ECR15. Roumiantsev, S., Krause, D. S., Neumann, C. A., Dimitri, C., Asiedu, F., Daley, G. Q., ... Van Etten, R. A. (2002). Stem cell myeloproliferative disease and T-lymphoma induced in mice by the ZNF198-FGFR1 fusion gene of human 8p11 myeloproliferative syndrome. Blood, 100(11), pp.141A. Elles, R., Cross, N., Gokhale, D., Harvey, J., Ramsden, S., Barber, J., ... Day, I. (2002). The National Genetics Reference Laboratories. Journal of Medical Genetics, 39, pp.S26. De la Fuente, J., Merx, K., Steer, E. J., Muller, M., Szydlo, R. M., Maywald, O., ... Hochhaus, A. (2001). ABL-BCR expression does not correlate with deletions on the derivative chromosome 9 or survival in chronic myeloid leukemia. Blood, 98(9), 2879-2880. Olavarria, E., Kanfer, E., Szydlo, R., Kaeda, J., Rezvani, K., Cwynarski, K., ... Goldman, J. M. (2001). Early detection of BCR-ABL transcripts by quantitative reverse transcriptase-polymerase chain reaction predicts outcome after allogeneic stem cell transplantation for chronic myeloid leukemia. Blood, 97(6), 1560 - 1565. Reiter, A., Saussele, S., Grimwade, D., Wiemels, J. L., Segal, M., Weisser, A., ... Cross, N. C. P. (2001). Genomic anatomy of the t(15;17): significant subclustering of genomic breakpoints within RAR alpha intron. Blood, 98(11), pp.586A. Kreil, S., Muller, M. C., Lahaye, T., La Rosee, P., Corbin, A. S., Schoch, C., ... Hochhaus, A. (2001). Molecular and chromosomal mechanisms of resistance in CML patients after STI571 (Glivec) therapy. Blood, 98(11), pp.435A. Steer, E. J., Goldman, J. M., & Cross, N. C. (2001). Mutations of the transcription factor AML1/CBFA2 are uncommon in blastic transformation of chronic myeloid leukaemia. Leukemia, 15(3), 476 - 477. Pourgourides, E., Heath, C., Melo, J. V., Rahemtulla, A., & Cross, N. C. P. (2001). Specific action of FGFR inhibitors against t(4;14) positive myeloma cells. Blood, 98(11), 370A-371A. Steer, E. J., Demiroglu, A., Heath, C., Pourgourides, E., Taylor, K., Bentley, M., ... Cross, N. C. P. (2001). The t(8;22) in chronic myeloid leukemia fuses BCR to FGFR1: transforming activity and specific inhibition of FGFR1 fusion proteins. Blood, 98(11), pp.468A. de la Fuente, J., Merx, K., Steer, E. J., Müller, M., Szydlo, R. M., Maywald, O., ... Hochhaus, A. (2001). To the Editor. ABL-BCR expression does not correlate with deletions on the derivative chromosome 9 or survival in chronic myeloid leukemia. Blood, 98(9), 2879 - 2880. Cross, N. C. P., & Reiter, A. (2007). BCRl-ABL-negative chronic myeloid leukaemia. In J. V. Melo, & J. M. Goldman (Eds. ), Myeloproliferative Disorders (pp. 219-234). (Hematologic Malignancies). Berlin; Heidelberg, Germany: Springer. Cross, N. C. P., & Hochhaus, A. (2003). Minimal residual disease in chronic myelogenous leukemia: results of RT-PCR detection of BCR-ABL transcripts. In M. H. Schreiber, T. F. Zipf, & D. A. Johnston (Eds. ), Leukemia and Lymphoma: Detection of Minimal Residual Disease (pp. 179-199). Humana Press. Steer, E. J., & Cross, N. C. P. (2003). Myeloproliferative disorders with 5q31-35 rearrangements. In B. J. Bain (Ed. ), Chronic Myeloproliferative Disorders: Cytogenetic and Molecular Genetic Abnormalities (pp. 69-79). S. Karger AG.